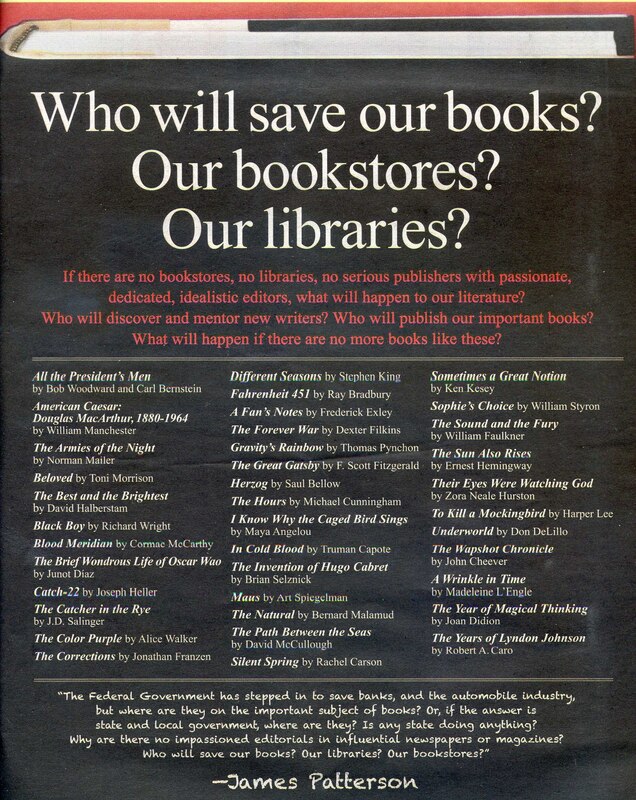 There’s a lot of discussion about the book business and changes affecting it in recent months and more specifically recently with James Patterson’s book future ad in the New York Times Review and in Neil Gaiman’s 2013 London Book Fair speech. There’s also a lot of fear being bandied about – fear of the change of book form, fear of the loss of bookstores and libraries, fear of the shrinking of traditional publishing, fear of the online services that promotes the changes. That’s a lot of monsters under the proverbial bed of books. Patterson’s ad is full of implied problems that create these fears. Accusations such as that there are “no serious publishers with passionate, dedicated, idealistic editors” and questions like, “Who will discover and mentor new writers?” throw some serious shade at the state of self-publishing. 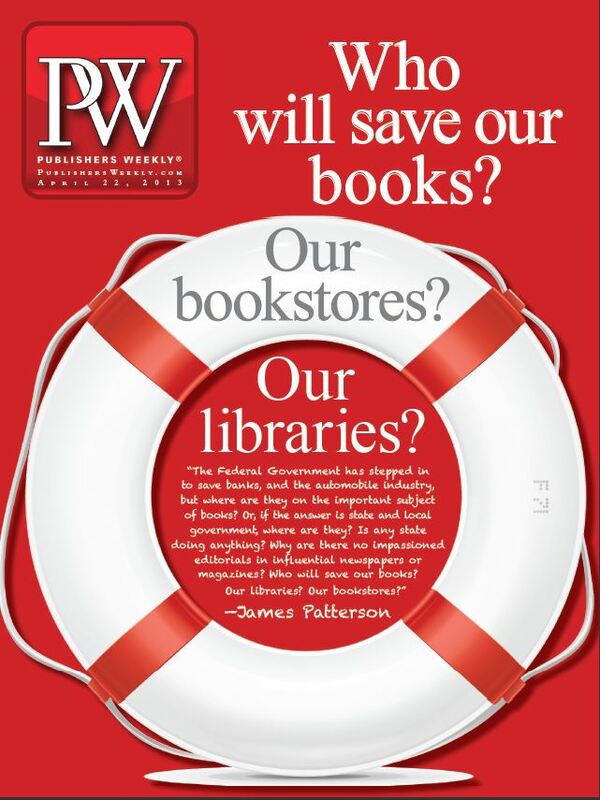 The ad is aimed at saving traditional publishing and reinforcing the wall surrounding that institution. It’s not a surprise to those who self-publish that they are being locked out of consideration. While self-published fights to get a footing to be taken seriously by publishing professionals, what Patterson misses is that it’s now the readers who do the discovering. And maybe he expresses a fear in that model because if his work never went through the traditional publishing machine, would the general reading public “discover” and buy his books? Patterson anchors his argument with a list of classic books and authors. The list is diverse in its genres from non-fiction to fantasy and in its authors backgrounds. It’s meant to give more credence to his argument, and to attach his name (written in large letters at the bottom) to that venerable list. The suggestion is that without a major fix to traditional publishing, the reading public could lose books like those listed, which includes my all-time favorite To Kill A Mockingbird. Many question Patterson’s connection to the list as his writing output includes a more factory method of production. Popular? Yes. Of the same caliber as those he lists? Questionable. The government bailout he rallies for at the bottom of the ad is more worrying. Do publishing companies deserve a bailout like the banks received? Should the government have a hand in what gets published and what doesn’t? That’s the more worrying implication, which is too much like 1984 or Fahrenheit 451 and too overreaching for Patterson. He makes a plea to the wrong people. Who he needs to be asking to support books are the people who buy the books. How books get out to the readers becomes less the issue than the actual books themselves in his argument. Because of services offered by Amazon and others, there are new ways to find and purchase books. Like Gaiman states in his speech, change is here. It’s happening. And those involved in books need to change as well or be left behind. With pleas and arguments like Patterson makes, he is clearly in danger of being left behind. He asks for editorials to be written in newspapers and magazines (of which the print versions are also declining), and justifies both ads because of a need to “stir the pot”. But he fails to see that his own impassioned ads are stuck in the complain mode. In the Salon article that asked for his justification for the New York Times ad, he states that his part in response to the need to save books is his creation of his push to promote books to kids. He created a site at www.readkiddoread.com, and it does have a mechanism to help kids, parents, and educators find books. That addresses who he thinks should be reading (beyond those he wants buying his own books). But it doesn’t really address his main grievance in the actual production of books. Patterson should read the transcript and watch Neil Gaiman’s speech. He is trying to stop the change and turn back the clock to a time where traditional publishing was the only way to produce a book and for readers to find them. According to Gaiman, you can’t turn back time (no matter how many Doctor Who episodes he writes). It’s a losing battle, and Gaiman gives a couple of examples how he moves and changes to get his work out into the world that have already had startling results. It should be noted that neither author really acknowledges the promise of self-publishing and the indie author, and how new books are being discovered by both the readers and traditional publishing world. In Patterson’s argument, he implies that self-publishing cannot produce as good of a product for lack of editors and the publishing mechanism provided by the big houses. In Gaiman’s speech, he acknowledges that Amazon does change the landscape of how books are obtained, but does not go so far as calling them the progenitor of the problem or the enemy. Nor does he say that Amazon is the most successful self-publishing outlet right now, or that self-publishing is the wave of the future. But he does encourage people to be dandelions and to try many things, so why not self-publishing? However, Gaiman’s message is more positive and more inspiring than Patterson’s. There should be a dialogue about change in the book and in the industry, but that dialogue doesn’t mean finding a solution to reclaim what has already evolved. It means discussing the change and finding new ways to get books out into the world. Gaiman’s dandelion proposition is more likely to produce experiments and results that will actually provide answers and in the long run – more books for readers to find. And isn’t that really the outcome we’re all looking for? Meant to tell you how much I enjoyed your article. Still can’t believe how ridiculous Patterson’s point of view seems to be. Thanks for shout out and I look forward to reading more of your stuff. Thank you for a great post on it! As soon as it popped up in my Facebook feed, I tracked down that ad and had to share it. I just can’t believe how lost and backward thinking some people involved in the publishing industry are right now. Thanks for stopping by! You’re welcome anytime!